Fonzi’s eyes were examined by a board certified Canine Opthamologist when 8 weeks of age (in March 2016). At 32 months (Sept 28, 2018) Fonzi’s OFA eye certification was redone to make sure his eyes are still disease free. We are pleased that he had a Normal/Clear report again. Stay Calm Christmas is Coming…but first think fall colors! We have Japanese Lanterns up the ying yang….PICK YOUR OWN …PLEASE call Mary at 315-668-1195 for an appointment! Immense job of clearing snow at Grace Farms has begun. We will be OPEN on Good Friday at 9 am for Pre-Cut Tree and Wreath sales. AND customers are prepared for wallowing around in deep snow where there are no paths, there might be “Cut Your Own” tree sales that day as well. OPEN just 7 days this year. On site Choose and Cut Trees, Wreaths and Pre-Cut tree hours for the public: 9 am until 4:30 pm Black Friday plus Saturdays and Sundays only until our last day: December 9. Visit us at Grace Farms 78 Gunther Road, Central Square, NY 13036 to see the wreaths available or order one custom made to your specifications. We have sold our yellow Labrador Retriever “Grace Farms Augustus Plus JH” to a family South of Syracuse, NY for being a companion/water fowl retriever. We couldn’t be happier with the perfect fit that the family reports to us! With barns still being used to store hay and straw…vermin like the norway rat are starting to move in to stay warm. It is something farmers deal with….but cats are not the answer to large rodents…which can scare a cat away with one bite. Farmers with terriers/herding breeds of all sorts/hybrids of prey driven breeds/and any breed that has a good nose and perseverance can have tons of fun in a new sport that has been designed to “train” dogs specifically to the scent of a live rat. 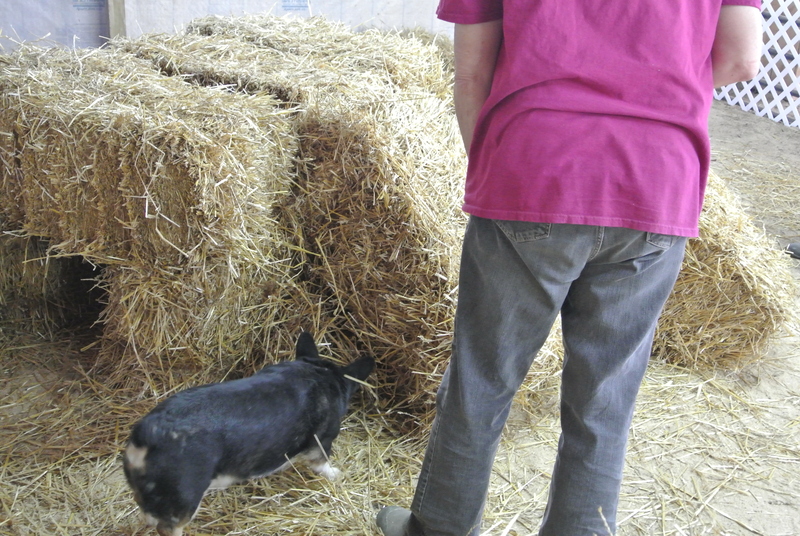 Can your dog search 30 bales of hay in under 3 minutes to find just one caged rat? If you are wanting to train for something your dog LOVES to do….old or young dogs….then barn hunt is for your team! check it out! We’ve been growing Christmas trees since 1977! PLEASE NOTE! We are NOT open weekdays! WE ARE OPEN 9 am-4:30 pm on THESE days: FRIDAY Nov 23, SATURDAY Nov 24, SUNDAY Nov 25 as well as SAT Dec 1, SUN Dec 2, SAT Dec 8 and SUN Dec 9. Enter your email address to follow Grace Farms and receive notifications of news by email.